Can a laptop hinge be replaced or repaired? Laptops fall, someone sits on the computer or the lid gets forced open too wide and they are broken. Madison Geeks see laptops come to our shop in with a variety of problems. Some customers bring in two pieces – a top and a bottom. Then there are times when one hinge may just seem loose. The LCD screen may be pulled away from the base. If you experience failure we suggest you bring your laptop in for repair or replacement sooner rather than later. If you have one hinge that is on the fritz, it's best to take care of it right away since the other hinge will be doing double the work to hold up the laptop screen. 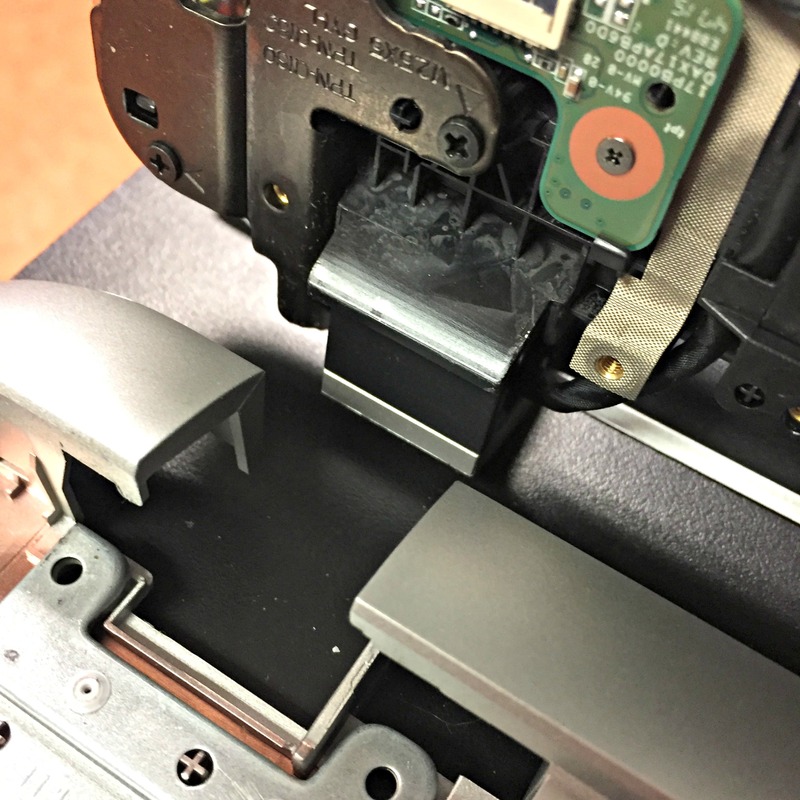 A failing hinge can not only result in the LCD screen falling off, the video cable that connects the screen to the motherboard can be pulled loose or even broken. The loose or broken parts may also damage components in the base of the laptop. The power jack can also be affected. There are a lot of small items in there. If both the hinges and LCD are broken, we can repair both of these at the same time. How can you avoid breaking the hinge on your laptop? Never carry your laptop by the lid. When opening or closing the lid use both hands on each corner or one hand pulling or pushing on the center of the lid. Never lay your laptop down on a surface where someone can sit on it. Lower priced consumer laptops will have weaker components that business class models which are more durable. Hinges are among the items which wear out first on the consumer units. If you need a repair or replacement contact us, we're here to help.